Water: nothing’s better for your health and beauty! That’s why it always have a thermal water with me. My favorite one is the Avène Eau Thermale Spring Water Spray. This thermal water has soothing and anti-irritating proprieties. That’s why it is ideal for sensitive skin. Thanks to the low salt mineral content and the neutral pH, the thermal water does not dry out the skin and nor irritates our eyes(or skin). It can be used in many ways. I do prefer to use it during summer, especially when I am on the beach, while travelling or taking a walk. Lately, I have one in my diaper bag as it is great for diaper rash. I also apply it to set my make up (just like the Fix+) or to spray my brushes when I want to use my eyeshadows wet. I use it against redness: I spray a good amount onto a cotton pad I apply it on the irritated part of my face and leave it for 5-10 minutes. Other uses: as a toner after cleansing, to sooth irritated skin after shaving/waxing, against sunburn and burns. I don’t remember its cost, but I do remember that the 50mL bottle has a reasonable price. I prefer the small version(50mL) because it is easier to have it in your bag and carry it wherever you want. 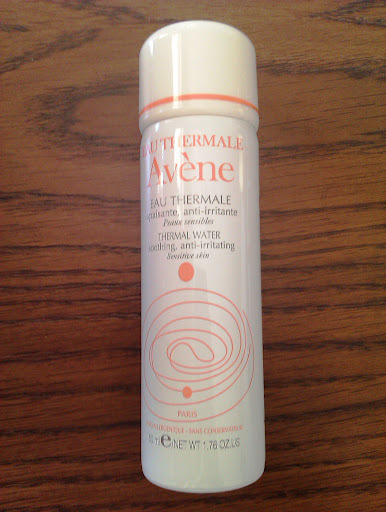 Avène Eau Thermale is probably my must-have skincare product! I adore it and I will never stop buying it! Have you ever tried it? Do you use thermal water? Do you think it is necessary for our skincare routine? I can’t wait to read your comments!!! Take a look here: http://twitter.com/avene_skincareIt's Avene's Indonesia official twitter page and they give info, mail and telephone number. Feel free to contact them and ask them where you can find their products. Oh! And don't forget to let me know your opinions! Where i can buy it in Indonesia?